I have owned the Nordic Track for at lease 14 yrs or longer. The machine is very well made and I have never had any problems until now. It cuts off when I put my weight on it. I will lube and adjust the belt, no maintenance has ever been done. I think this will take care of the problem. I am a runner and use it a lot during the winter months. had it for 10 yrs but i never used it alot i would walk on it for 15 minutes and it would shut off blow the breaker i replaced just about everything 2 circert boards motor and the transformer and the breaker and it still pops the breaker after about 15 mintues can somebody help me please ! We have owned and used this treadmill for 14-15 years (probably longer). It has always run and never needed service. We use fast walking speeds - not running. The heart monitor never worked well, but it's perfect otherwise. This was on sale at Sears and I know why! The bottle holder does not hold a water bottle. I had to makeshift a taller device, so the small water bottle would not fall out!! So anoying! Also, what is up with the left side holding thing?? it is just two molded troughs that hold nothing...? 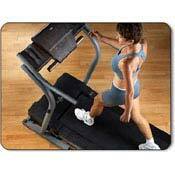 Otherwise, this treadmill has been used a lot and has no problems mechanically. Just saying...check out the design of convenience before buying. What was someone thinking when this was designed?? My father purchased the EXP1000 from Sears bargain center (forget what reason it was there) about 8 years ago. He has been putting on at least 1 to 2 miles jogging on it every day since. It has had not a single issue ever. Has been fantastic. I'm just looking for a manual to see if there's any maintenance that should be done. Have had this product for like 8 years still works fine never had to call customer support so I can not speak on there behalf but all in all it work great still. Folks - If you hold the stop button while inserting the blue key, the display will show hours used and miles run since day 1. I have 162 hrs & 694 miles on mine. I do intervals at 7 - 8 mph for a few minutes, then back to 4 mph for a minute; the platform is very soft and makes for a nice low impact run; I also have a program I downloaded from the internet that allows me to control the treadmill using the audio plug (ifit.com), and I sometimes use the ifit.com web site and view videos or listen to CDs while it controls the treadmill. It's a great treadmill, but does shake and is noisy while running, but with headphones it's not an issue for me. You do need to do some preventative maintenance: the underside of the belt needs to be lubed every couple of years (depending on use), and you need to run the treadmill thru all elevations periodically to keep things in good shape. Had a shutting down issue; NT sent me a new breaker which I easily installed. I found their customer service to be great. La Fitness (gym) treadmills, but their platforms are much harder (stiff), although they don't shake or are as noisy. will use treadmill at local gym instead. Ce produit n'a jamais réellement fonctionné.Je l'ai déjà fait repartir à mes frais . Il va toujours pas . Il freine tout le temps et est meme dangereux. Je ne l'utilise plus jamais. Nordic Track EXP1000 has worked great for us; we have been using it for over a year without any real problems that a quick call to Sears did not result in a quick adjustment. Treadmills at the gym which are similiar in quality and performance.